Che ne dite di qualcosa di dolce per coccolarsi dopo una giornata di lavoro ?! Allora dovete proprio assaggiare questo! E’ una ricetta, nata per gioco qualche settimana fa, in occasione della mia timida partecipazione al Contest “Il piatto DiVino” sul Blog di Luca e Bruno http://perunpugnodicapperi.blogspot.it. Il Contest prevedeva l’utilizzo del vino per preparazioni dolci o salate. Dopo l’indecisione iniziale, ho cominciato a pensare, per entrambe le preparazioni, a qualcosa di originale che coinvolgesse tutti i sensi. Qualcosa che, dopo il primo assaggio, incuriosisse fino a richiederne un secondo e, che sprigionasse, ogni volta, note e fragranze accattivanti per il palato. Ne è risultato un dolce raffinato e goloso la cui ricetta mi è stata richiesta da tanti, prima fra tutti, Emilia, la mia amica/collega, a cui la dedico! Sciogliere il burro su fiamma bassa e farlo raffreddare. Lavorare le uova con lo zucchero, la vaniglia e il pizzico di sale. Aggiungere la panna e mescolare bene. Setacciare la farina ed il lievito insieme. Aggiungerli all’impasto. Aggiungere lentamente il burro fuso. Versare i cubetti di pera nel composto. Amalgamare delicatamente. 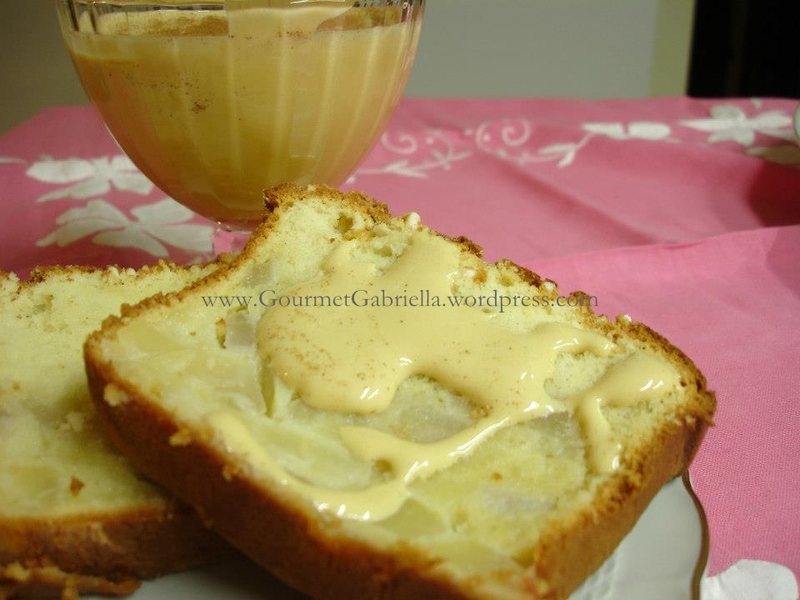 Versare il composto in uno stampo da plumcake imburrato ed infarinato. Cospargere di zucchero in granella. Cuocere per i primi 10’ a 200° poi continuare la cottura a 180’ per i restanti 35’. Far raffreddare e sformare. In una zuppiera lavorare i tuorli con lo zucchero. Aggiungere il vino e la grappa. Cuocere la crema a bagnomaria continuando a sbattere con la frusta fino a quando il composto diventa spumoso. Versare la crema in una salsiera e spolverizzare con la cannella. Servire caldo come accompagnamento al dolce. Are you looking for something sweet to pamper yourself after a long day of work !? Then you just have to try this! It’s a recipe created as a game a few weeks ago, by way of my timid participation in the “Il Piatto DiVino” Contest held by Luca and Bruno’s Blog http://perunpugnodicapperi.blogspot.it. The Contest involved the use of wine to make a sweet or savoury dish. After an initial hesitation, I began to think about what I could prepare, something original that would involve all of the senses. Something that, after the first taste, should make you curious for another, and that with each tasting, would release its notes and fragrances and be appealing to the palate. The result is a delicous and elegant dessert, the recipe for which was requested by many. First of all by Emilia, my friend/colleage, to whom I dedicate it! Melt the butter over low heat and allow to cool. Beat eggs with the sugar, vanilla and a pinch of salt. Add the cream and mix well. Sift the flour and baking powder together. Add to mixture. Slowly pour melted butter in. Pour the pear cubes into the mixture. Mix gently. Pour batter into well greased and floured baking cake pan. Sprinkle the surface with pearl sugar. Bake at 400° F for the first 10’ then continue cooking at 350° F for the remaining 35’. Let cool, then remove from form. In a bowl beat egg yolks with the sugar. Add wine and brandy. Cook the cream in a double boiler. With a whisk continue beating until the mixture becomes frothy. Pour the cream into a sauce boat and sprinkle with cinnamon. Serve hot to accompany the dessert.